The Fiamma range of Fixing-Bar products have been carefully designed and are very strong and safe to use. With exception to Fixing Bar model, 'Roof Rail Ducato' all other Fixing-Bar equipment has been designed for Compact, Coachbuilt, Low-Profile and 'A' Class motorhomes with a flat roof. All Fiamma Fixing Bar accessories are suitable for roofs with a maximum width of 240 cm. 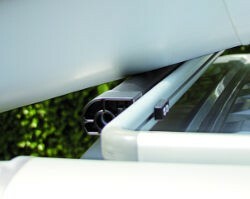 For narrower motor caravan roofs it is necessary to cut the aluminium bars to suit.